We are a non-profit, 501 (c)(3) Public Charity, volunteer-driven organization. Every cat in our program gets special attention. You can help by donating from our “wish list”, becoming a Volunteer driver (helping to drive our cats to and from the Vet) or by becoming a Foster home. The Humane Society of the United States The nation’s largest and most effective animal protection organization. 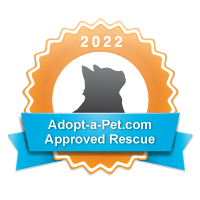 Petfinder.com With more than 13 million adoptions since 1995. Visit our listings and find a special friend today! –Adopt A Shelter – Just Shop To Donate! See: Vanessa "Chance at Life Cat Rescue"